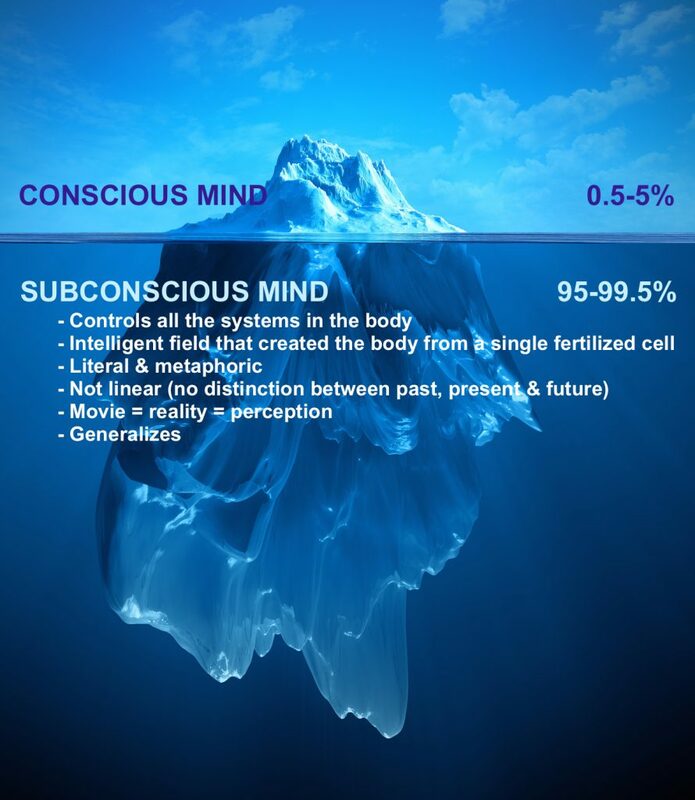 The Subconscious mind and health. Unlike Freud, who believed that the subconscious mind was just a primitive reflex brain, modern hypnotherapy has come to realize that the subconscious mind – also known as the body-mind is the controlling intelligence in the body; it communicates with every cell of the body at all times and can affect health. Every thought, every emotion, every desire, and every internal representation of life is monitored and overheard by the subconscious mind. The subconscious mind’s job is to maintain what the conscious mind believes. Do you think you don’t deserve to be healthy? Do you think that the pain or disease is just going to get worse? Whatever you believe deeply… the subconscious will make it so. The subconscious mind holds the repressed memories and beliefs, the shadow aspects of self, to whatever extent it needs. It does this to balance the conscious mind. Unfortunately, if those memories and aspects of self-are not processed and reintegrated into our lives, they may remain locked in the confines of the body and express themselves as symptoms and tensions. The subconscious mind is in charge of all the physical body systems. It has been guiding and developing it from its embryonic state. The subconscious mind is aware of any ailments the body is experiencing and is responsible for how those ailments evolve and are expressed. Outer influence such as accidents and trauma, external stressors, and environment are major influences on your health. But it is the subconscious mind that dictates how the body is responding to the external factors of your life and what aspects of that adaptation the conscious mind needs to be aware of. MINDbasedHealing, through hypnosis, regression therapy, NLP, and Gestalt, is dedicated to communicating with the subconscious mind and accelerating healing.